Hilborn Style Air Scoop. FOR SALE - complete polished aluminum smooth air scoop kit. Polished Aluminum, Smooth Top, Single 4BBL Carb. This applies. To prevent any delays with your order you should watch for the following common issues. Hilborn Style Air Scoop. Complete polished aluminum smooth air scoop kit. Polished Aluminum, Smooth Top, Single 4BBL Carb. SPECTRE PERFORMANCE AIR CLEANER 47708. K&N Spectre 9x2 Air Cleaner. PALE RED K&N STYLE WASHABLE FILTER. K&N Pale Red/Pink Filter Color. TBI STYLE THROTTLE BODY W/ 5 1/8" NECK. ITEM CONDITION. once Checkout is complete. 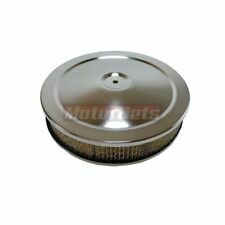 This is a New OEM GM Engine Intake Air Filter Complete Assembly for the Chevrolet GMC and Cadillac. Manufacture : GM / OEM. Contents : Filter Box ; Engine Air filter ; w/Sensor. TAHOE : 2015-16. SUBURBAN 1500 : 2015-16. WITH 5 1/8" CARBURETOR OPENING. FITS CARBS WITH 5 1/8" OPENING (HOLLEY, EDELBROCK, ROCHESTER, ETC.). 1" ALUMINUM AIR CLEANER SPACER. MADE FROM HIGH QUALITY ALUMINUM. Edelbrock Air Cleaner Pro-Flo Low Profile V8 With 4-Barrel Edelbrock Pro-Flo Low Profile Air Cleaner for V8 Mustangs with a 4-Barrel Carburetor. Pro-Flo 1000 is an economical and effective way to keep clean air feeding your engine without the expense of a new filter every few thousand miles. K&N's cabin air filter refresher increases the electrostatic properties of the cabin air filter helping it to trap contaminants. Cleans and refreshes K&N cabin air filters. It's that feeling you get when you rev up that engine. Holley - Edelbrock - Quadrajet - Quickfuel. 4 Barrel Polished Aluminum Hilborn Style Carb Finned Air Cleaner Hood Scoop Kit. It has all the hardware needed for installation They are not flawless, but you will be very happy with the quality. 8802 Scoop (10#). 12" OVAL FINNED BLACK ALUMINUM AIR CLEANER. A PERFECT MATCH TO FINNED ALUMINUM VALVE COVERS (CHEVY, FORD, OR MOPAR). INCLUDES ALLEN HEAD TAPERED AIR CLEANER STUD TO GIVE THAT SMOOTH LOOK. AIR SCOOP PRO SERIES POLISHED ALUMINUM 3 BARREL STYLE # 5239 CLEARANCE SPECIAL! No air scoop on the market has such a serious race look to it. Hardware and linkage included. This is a very well made item, and certainly gives a car a stunning drag car look. You can reverse the butterfly plates and they are black. Land Rover Discovery 2 4.0L and V.6L V8 Gas (99-04). Land Rover Discovery 2 Diesel TD5 2.5L from VIN 2A757202. 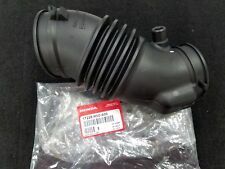 Durable watertight Air Intake tube which connect the air filter Box to the elbow at the fender. FOR SALE - complete polished aluminum finned air scoop kit. Hilborn Style Air Scoop. Polished Aluminum, Full Finned Top, Single 4BBL Carb. This applies. To prevent any delays with your order you should watch for the following common issues. Edelbrock 1208 Pro-Flo Series 10 X 2 Chrome Air Cleaner Edelbrock Holley. HALF FINNED POLISHED ALUMINUM 15" AIR CLEANER. 15" OVAL HALF FINNED POLISHED ALUMINUM AIR CLEANER. A PERFECT MATCH TO FINNED ALUMINUM VALVE COVERS (CHEVY, FORD, OR MOPAR). INCLUDES ALLEN HEAD TAPERED AIR CLEANER STUD TO GIVE THAT SMOOTH LOOK. NEW OEM Honda Air filter. This filter fits Honda Civics from 2006-2011 with the 1.8 L engine. This will NOT fit the Si or Hybrid. This is a genuine Honda part. HALF FINNED POLISHED ALUMINUM 12" AIR CLEANER. 12" OVAL HALF FINNED POLISHED ALUMINUM AIR CLEANER. A PERFECT MATCH TO FINNED ALUMINUM VALVE COVERS (CHEVY, FORD, OR MOPAR). INCLUDES ALLEN HEAD TAPERED AIR CLEANER STUD TO GIVE THAT SMOOTH LOOK. Air Cleaner Top Design: Edelbrock logo. Air Cleaner Shape: Triangular. Air Cleaner Size: 11 3/8 in. long x 8 3/8 in. Air Cleaner Top Material: Steel. 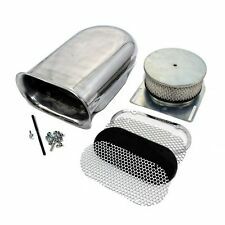 Chrome 10" air cleaner set Fits 2 bbl carbs with 2 5/8" opening 10" x 2" round 2bbl chrome air cleaner kit Comes complete as shown with chrome lid, 10 x 2 paper filter, chrome steel base, 2 bbl adapter (2 5/8" opening) and a new stud & wingnut 2 5/8" opening to fit most 1bbl & 2bbl carburetors Fits chevy, ford, mopar (chrysler, dodge, plymouth), stromberg, rochester carbs with 2 5/8" opening . Model: JEEP CHEROKEE. Air Cleaner. We're not responsible for installation errors, labor expenses and/or any other expenses that may occur. We make pictures of every single item, so you can see its exact condition. Feature: 5-1/8" carb necks 20-1/2" long 11-1/4" wide 6" tall 5-1/4" diameter air intakes The opening at the base of the scoop is 7-3/8" x 18-1/8" 6" minimum carb spacing center-on-center 12" maximum carb spacing center-on-center Air filter elements are 6.38" O.D. x 2.38" tall Brand Deepmotor Manufacturer Part Number DM-5334|motor Mounting Hardware Included Yes Color Silver Material Aluminum. 14" x 3" AIR CLEANER SET. FITS CHEVY, FORD, & MOPAR (CHRYSLER, DODGE, PLYMOUTH) CARBS. FITS MOST HOT RODS AND CLASSICS ENGINES INCLUDING GM (CHEVY, GMC, OLDS, CADILLAC, PONTIAC, BUICK, FORD, & MOPAR (CHRYSLER, DODGE, PLYMOUTH). ). Half Finned Cast Aluminum 12" Air Cleaner Assembly -Fits 5 1/8" Carburetors (Edelbrock, Holley, Demon, Rochester Etc.) -Fins and most of top is Polished -As Cast in Between the Fins -Overall Measurements are 12" X 8 5/16" X 4" -Will Clear HEI Distributors -Filter is Standard 8 1/8"x 11.5" x 2" -Great Finishing Touch for your Hot Rod, Rat Rod, Muscle Car, or Custom. Part# 47626. SPECTRE BLUE EXTRA FLOW AIR CLEANER. This assembly includes an ExtraFlow filter lid, which increases filter area and allows it to outperform standard closed lids. AIR CLEANER. EXTRA FLOW. 15" Oval Partial Finned Polished Aluminum Air Cleaner. For sale is a new 15" oval polished aluminum air cleaner set. Partial finned "retro" top. "Partial" finned top design. Polished cast aluminum. 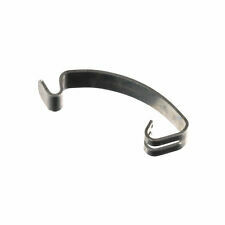 Thick cast aluminum, classic styling! For sale is a complete polished aluminum finned air scoop kit. Polished Aluminum, Finned Top, Single or Dual Carbs. Don't forget to add our Shotgun Style Scoop Dual Carburetor Linkage Kit which you can findHERE. This is a new Polished Aluminum "Hilborn Style" Finned Hood Scoop with single air cleaner. Part # SRN 5246 POLISHED 5 FINNED. (1) 14" Hood air scoop. Mounting hardware. Vinyl Die Cut decal. Easy to use, just follow directions sent with decal. WITH 5 1/8" CARBURETOR OPENING. FITS CARBS WITH 5 1/8" OPENING (HOLLEY, EDELBROCK, ROCHESTER, ETC.). 1/2" ALUMINUM AIR CLEANER SPACER. MADE FROM HIGH QUALITY ALUMINUM. Part # 2179. Note: Will not fit Demon or Dominator carb studs. - Part Type : Air Cleaner Intake Duct Tube Hose - Quantity : 1Pcs - Replace Part number :04593913AB - Condition : New, Aftermarket - Applications : 2011-2017 JEEP PATRIOT WITH 2.0L & 2.4L ENGINE 2011-2017 JEEP COMPASS WITH 2.0L & 2.4L ENGINE. It has all the hardware needed for installation They are not flawless, but you will be very happy with the quality. Dual 4 Barrel Aluminum Hood Scoop Air Cleaner Hot Rod. Plus, we have access to thousands of parts that are not listed. ® Heavy Duty Gear Shift Boot Insulator. Premium heavy duty Gear Shift Boot Insulator, designed tough and made from the highest quality materials. Quantity Included: One (1) Premium Gear Shift Boot Insulator (mounting hardware not included). Air Cleaner Filter Box for 1999-2004 Toyota Tacoma V6 6cyl 3.4L fits 17700-07060. FITS 1 OR 2 BBL. CARBS INCLUDING RICHESTER 2GC, STROMBERG 97 AND MORE! BLACK 1 OR 2 BBL. SIMPLY LEAVE THE PLASTIC ADAPTER IN FOR 1 BBL. FITS ALL CARBS WITH 2 1/16" & 2 5/8" OPENING. 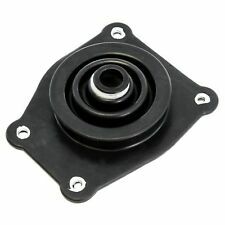 BLACK 4" x 2" AIR CLEANER. FITS 1 OR 2 BBL. CARBS INCLUDING RICHESTER 2GC, STROMBERG 97 AND MORE! SIMPLY LEAVE THE PLASTIC ADAPTER IN FOR 1 BBL. FITS ALL CARBS WITH 2 1/16" & 2 5/8" OPENING. 4" x 2" AIR CLEANER.